Most community pharmacies across Lanarkshire can now directly treat patients for urinary tract infections (UTIs) without an appointment, and a similar service for impetigo will follow soon. The new services are being rolled out across Scotland through the national initiative ‘Pharmacy First’. 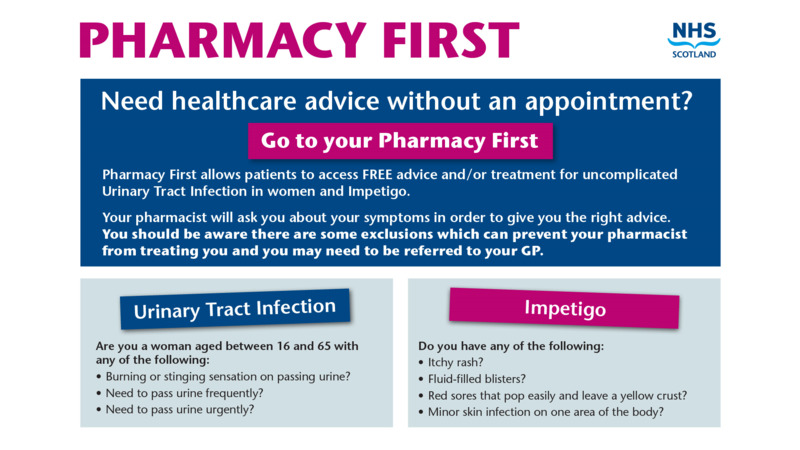 ‘Pharmacy First’ allows patients to access advice and / or treatment for uncomplicated Urinary Tract Infection in women aged between 16 and 65 and impetigo for any adult or child over 2 years of age without having to see their GP first. Patients seeking treatment for either condition will be asked about their symptoms to enable pharmacists to give the right advice and treatment. They are committed to making this service a success, and look forward to developing more ways in which to ease the pressure on our GPs and NHS24"
There are some exclusions which can prevent pharmacists treating a patient directly, for example patients who are pregnant or receiving cancer chemotherapy will need to be referred to their GP. Patients can find the location and opening times of their nearest pharmacy at www.nhsinform.scot or by calling 0800 22 44 88. The Doctors & Nurses at the Wellwynd Practice are committed to providing you with the best care. It is important that everyone who is eligible for a flu vaccination should attend every year for it. This will help you avoid complications of the flu infection. Please see our self-help information in our Help and Advice section for useful information on the management of minor illness. This year a shingles vaccine is being offered to people aged 70. 78 or 79 on 1st September 2014. People aged 70 in 2013/14 who missed getting the vaccine are still eligible this year. If you are in any of these categories an invitation letter will have been sent to you and you can contact reception to book an appointment. Shingles can be a very painful nerve and skin condition and is more common among older people. There is now a vaccine that can reduce your chance of getting shingles, or, if you do get shingles, it can reduce how severe or long lasting the symptoms can be. If you require more information the NHS leaflet “A Vaccine to Protect Against Shingles” is available from Reception. Consultations are available here to all patients registered with the Wellwynd Practice. Please call into our branch surgery on a Tuesday morning for your review bloods eg: diabetes thyroid, drug monitoring bloods e.g. if you are on methotrexate. Our doctors and nurses will also be consulting on a regular basis and appointments will be offered at the time of booking. Antenatal services are available every second Wednesday, please let us know when you are booking if you wish to attend Caldercruix or Airdrie. If you are a patient of Wellwynd Practice and you live in Caldercruix or near by please feel free to call us on our main number 01236 769333 choose option 0 or any of our direct lines for information. We will be updating this notice regularly with informaion about Caldercruix services. Please visit the web page www.nhsinform.co.uk/health-library/articles/a/antibiotics-penicillins to download a self help leaflet"Without Antibiotics". The Wellwynd Practice in Airdrie has established a fund of £2000 per annum to support the development of palliative care for all local patients, not just those registered with the Practice. The Partners in the Practice are personally funding this award in recognition of the support given to them and their patients by all staff providing local palliative care. Anyone providing palliative care to the local population may apply for all or part of this award. Applications will be considered each year by a joint panel of Practice, St Andrews Hospice and MacMillan Nurse representatives. Staff may apply for funding for professional courses, study days or team development initiatives. The 2013 Wellwynd Award supported a team of nurses from St Andrew’s Hospice to access training in clinical audit and how to use information from audit to improve clinical practice. Click here. If you wish to return this form by email, please complete the form and scan the data and send as an email attachment. Thank you.